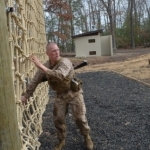 The Marine OCS Endurance Course. Some Will Fail. The Endurance Course is the most physically challenging event that candidates will have to undergo at Marine OCS. 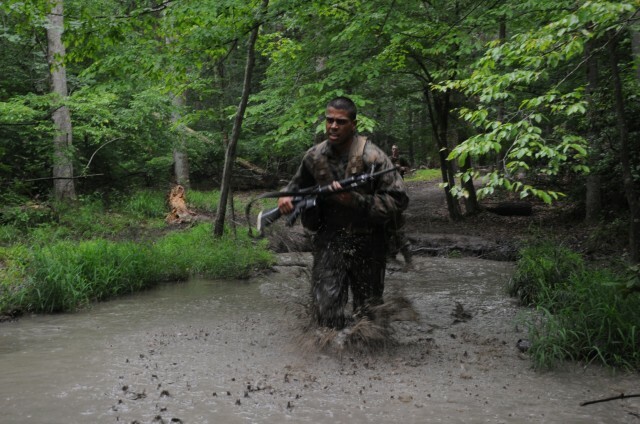 Everyone must complete the Endurance Course in order to graduate from OCS. It is an event that WILL send some candidates home. Females, in particular, tend to have a very difficult time with the course. However, males shouldn’t get too comfortable because there were more than a handful that had to retest. Some were even sent home. 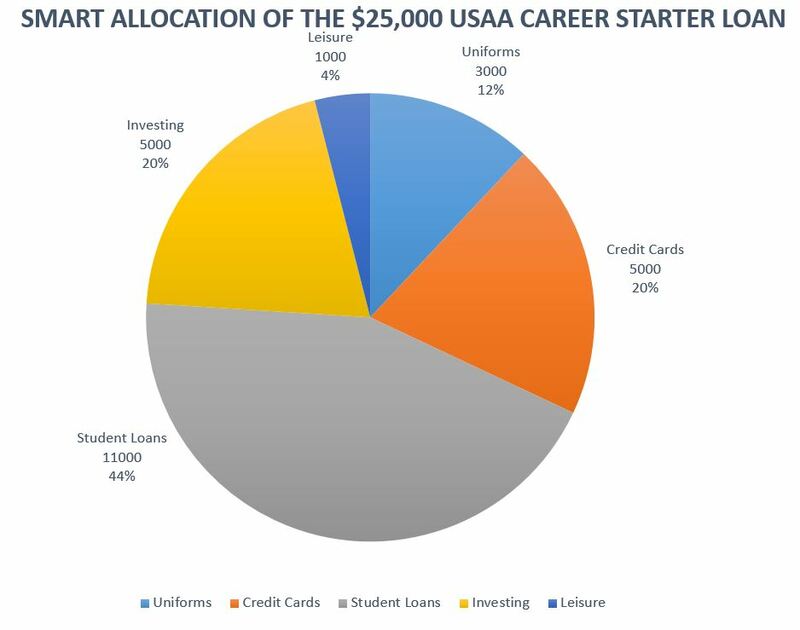 You can expect to go through the course a minimum of threes times (6-week Program). 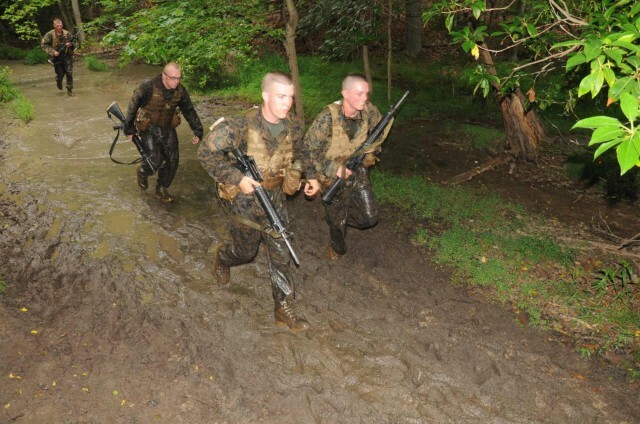 Failing the Endurance Course when running it for score could mean a ticket home. 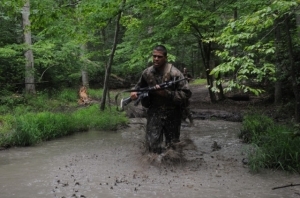 During OCS 2012, the Commanding Officer elected to allow candidates who failed an opportunity to retest not only a second time, but also a third. It will depend entirely on the OCS staff at the time you attend. 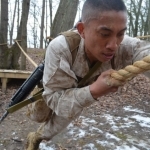 Prepare physically for OCS and you will not have to worry about doing the course 5 times to pass. The Basic School will have a course twice as long, so think of the OCS course as being a warm-up for what is to come. These are the items candidates must carry during the Endurance Course. The canteens CANNOT be emptied. You may drink them (sometimes this changes), but dumping the water out is an integrity violation that will get you sent home. The gear adds around 10 pounds to your load. The weight isn’t a huge deal, but the rifle can be cumbersome to carry. 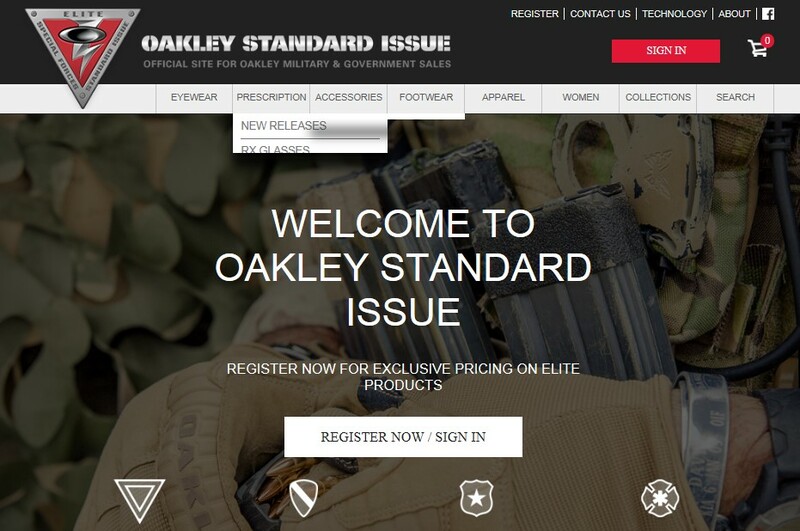 There are 3 authorized methods for carrying the rifle. 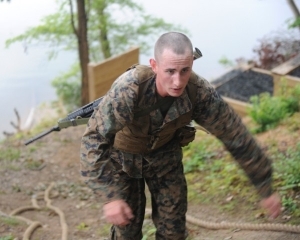 You will find what works best for you, but do note that certain events require a specific carry (e.g., cross body muzzle down is necessary for the rope wall). Wasting time moving the rifle will only hurt you. During the introduction run pay attention to which carries are necessary for which events. That way you can move the rifle BEFORE you get to the obstacle. This is the only method you shouldn’t use. Carrying the rifle in front of you with both hands is going to waste energy. Although, if you prefer this method just go for it. This seems to be the easiest carry method. Candidates can even use their LBVs to offload the weight on to their bodies. Hooking the pistol grip over a canteen will make life much easier. There isn’t any good reason to use this method unless it is required for an event. Several candidates went this route during the ungraded Endurance Course, but most find that it hinders your ability to run effectively. The rifle is going to be bouncing all over the place, and the pistol grip will dig into your lower back. As a disclaimer, these were the requirements during OCS 2012. Marine OCS is constantly changing so don’t be surprised if things don’t match up exactly when you get there. That being said, there is no reason for the minimum times to get changed unless the course changes. 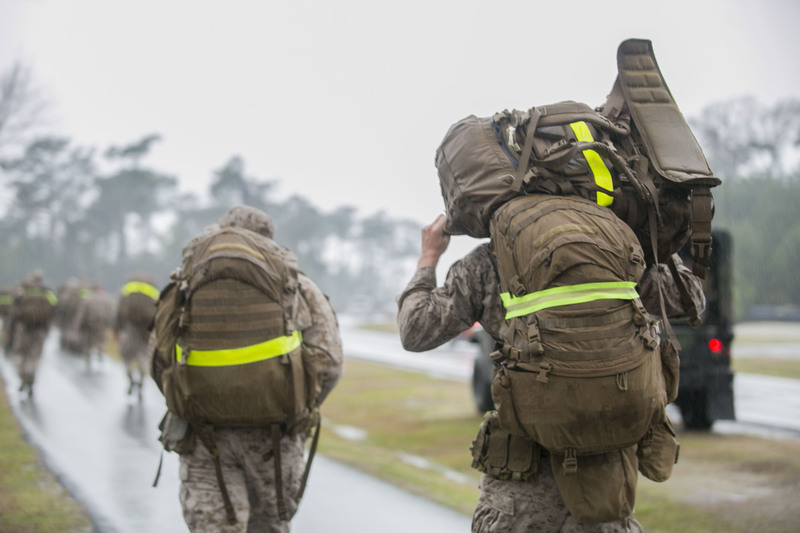 Although it would be impossible to exactly replicate the sequence of events, there are ways to prepare yourself for the Endurance Course both physically and mentally. 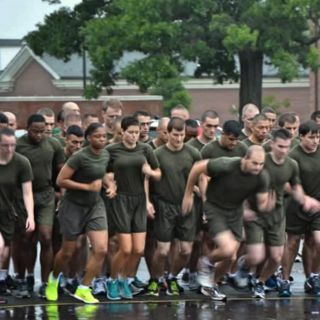 Getting used to running with boots is going to have a significant impact on your ability to perform at Officer Candidates School. This does not apply to the Endurance Course alone. Conditioning your feet to boots will help with hiking, drilling, the Obstacle Course, and just about everything else at OCS. 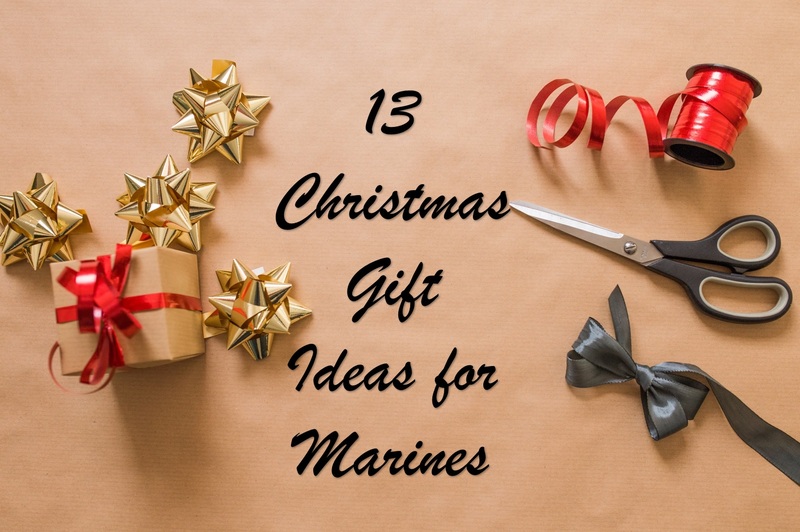 NROTC Midshipman and Enlisted Marines should be able to do this easily since they already have Marine Corps boots. For everyone else, it is highly recommended that you purchase some boots and start training in them as soon as possible. Ensure that you don’t overtrain and get injured. One or two workouts a week in boots and an additional day of walking around in them should suffice. 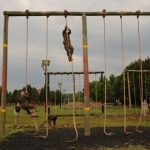 The Endurance Course contains dozens of different obstacles that candidates must navigate. Train your body to understand the transition between running and going through an obstacle. Here is a sample workout that can be modified for intensity and variation. The more confused your body becomes the better. Couple a workout like this with a pair of boots and your in for some intensity. Your main goal should always be to never stop moving. Don’t worry too much about sticking to the format of this workout. It is all about muscle confusion and training with intensity. If things are comfortable then you need to push harder. You are referring to the same thing. The 5-paragraph order refers to SMEAC (Situation, Mission, Execution, Administration and Logistics, and Command and Control). The acronym OSMEAC is used to remember the different parts of the OPORDER. The “O” stands for Orientation and is part of the OPORDER. When I went passing for males was 43 minutes and I wouldn’t say the e course is the hardest thing at ocs. I also was running a 300 and can do the o course at brown field in 59 seconds. Is the E-course a graduation requirement for females?